The bounty hunter returned to Slab City on a tip by a paid snitch who directed him to a busy camp where the road kid was roasting hot dogs with others. The bounty hunter brought three others, a total of four in three cars, and drove into the weenie roast yelling 'Surrender'. Instead, the kid jumped on his bicycle and led them on a merry chase through the camps of Slab City and exited into a lemon grove, where he climbed a tree and hid in the fruit until it got dark. Then he jumped down and returned to Slab City. I was approached by the Hula Hoop girl of the Music Range who quoted 'How to Infiltrate an Outlaw Town' saying: "'You use the Slab City men to get to the their women, and now I'm using Niederhoffer to get to you.' 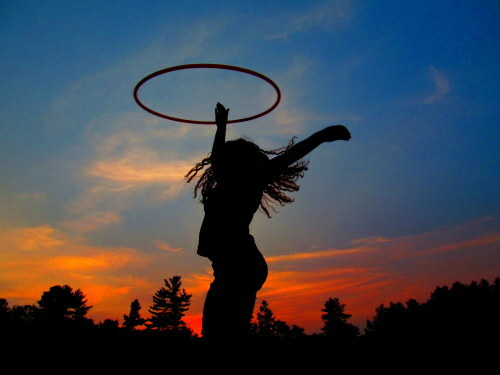 She wrapped her hoop around me and away we went.